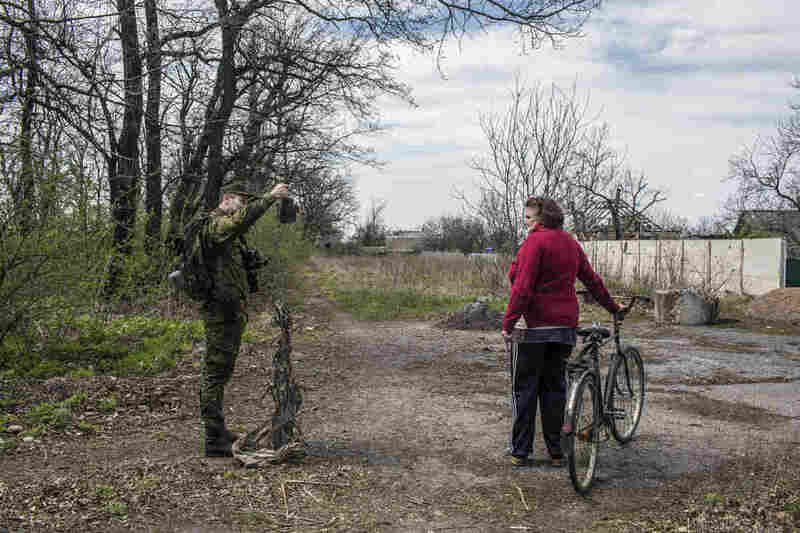 In Eastern Ukraine, A Struggle For Survival In The Crossfire Of A Little-Seen War : Parallels This year, 59 civilians have been killed and 280 injured as fighting continues in a 3-year-old war between Russian-backed separatists and government forces. Residents despair of ever seeing peace. 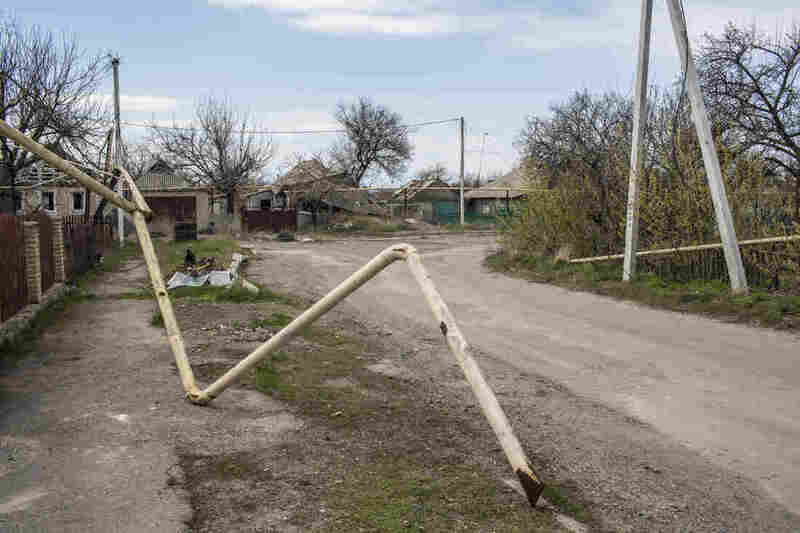 The 3-year-old war in eastern Ukraine, fought between government forces and Russian-backed separatists, has reached a stalemate with world leaders trying but failing to bring the conflict to an end. Nowadays, fighting is concentrated in five hot spots, where Ukrainian-held territory ends and the areas seized by rebels begin. The battles there aren't as much about moving those lines as they are about wearing the enemy down. But it's the thousands of Ukrainian civilians caught in the middle who are suffering, international monitors say. Many residents who could afford to move have gone to other parts of the country or beyond. Those who remain are at mortal risk, said Alexander Hug, deputy chief monitor in Ukraine for the Organization for Security and Cooperation in Europe. 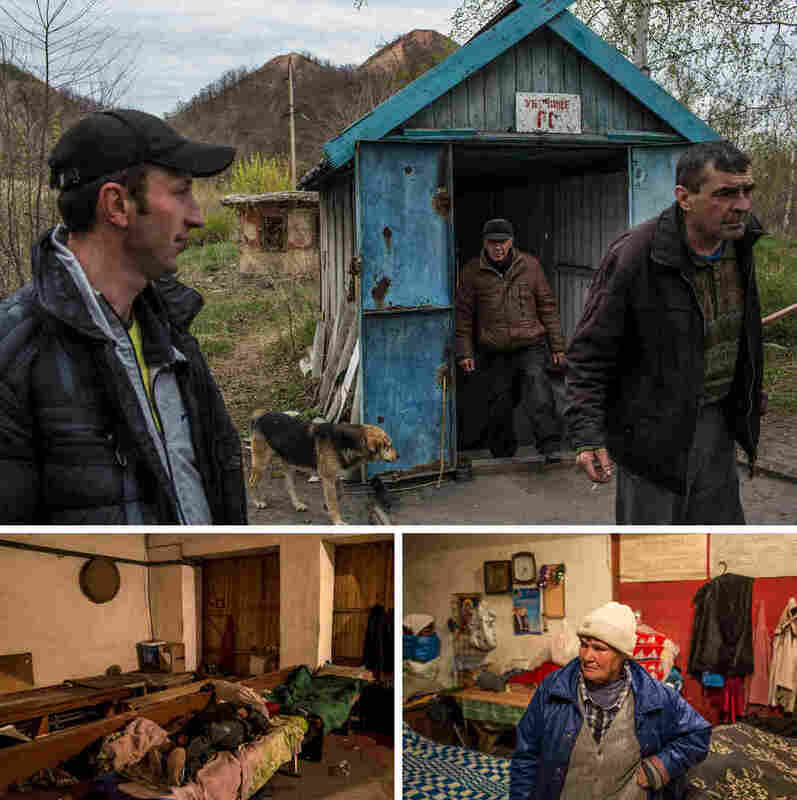 He added that these hot spot residents live with little power, heat or running water and endure gunfire and shelling almost daily. His agency reports that in the first seven months of this year, 59 civilians were killed and 280 were injured in eastern Ukraine. Last year, 88 civilians were killed and 354 were injured. "They are not in tanks and in armored vehicles," Hug said. "They are in their houses, in their beds. They are on the streets and in their gardens and they are fully exposed to these risks, and that has to be acknowledged. It is for them that this should come to an end." 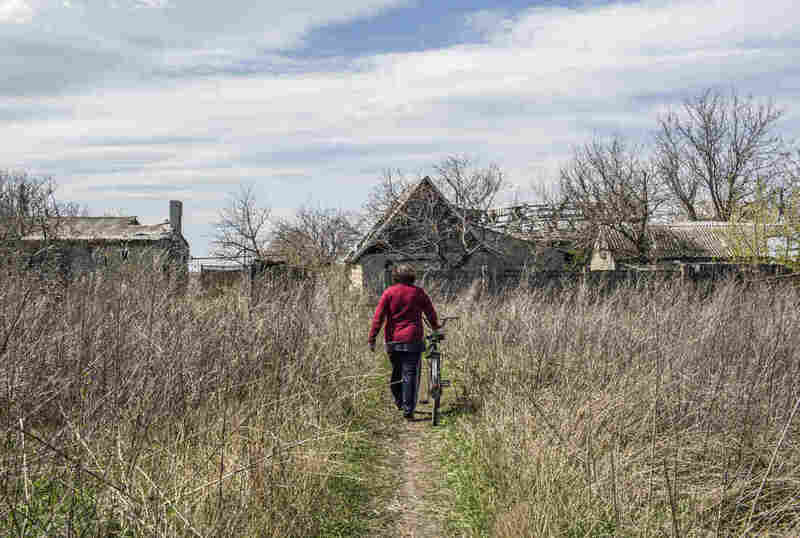 Raya Shaporova lives in the embattled village of Spartak, on the rebel side, and doesn't think that will happen soon — maybe not even in her lifetime. "I don't want to leave this place because it's my homeland. I gave birth to my children here," said the 70-year-old widow, who resides with four cats in her cottage close to the front line. 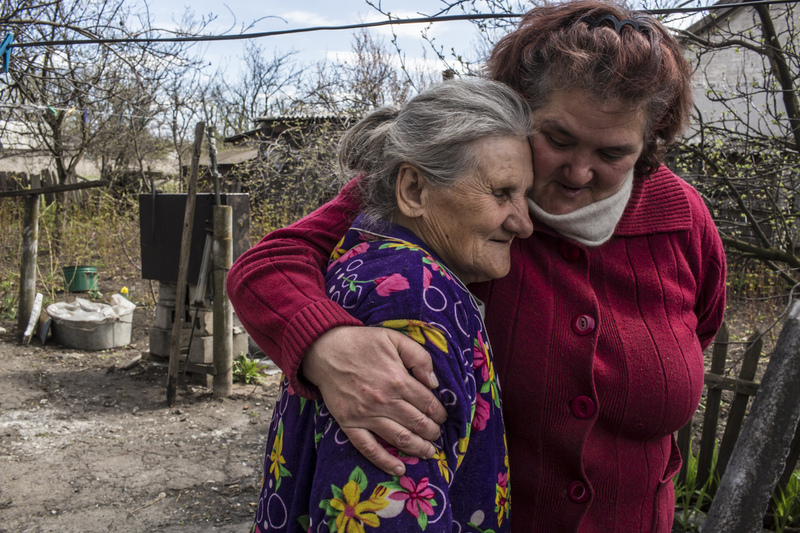 Raya Shaporova, 70, (left) a local resident who has not left despite the dangers of fighting all around, gets a hug from Vera Anoshina, 52, who lives nearby. She plants potatoes and daffodils in a garden that is littered with shrapnel. At night, Shaporova said she reads her Bible by lantern in a room she feels is safer than the others. She has turned that room into a combination bedroom, sitting area and kitchen. "He who suffers will be saved in the end," she said, blinking back tears. "Maybe that's my fate, to suffer. Maybe it's because I'm a woman." Neighbor Vera Anoshina, 52, gave her a reassuring hug. Anoshina reacted with little emotion, as is common with post-traumatic stress, when I asked her during a visit in April about how her neighbors were faring. "Many have died or been maimed," she said. "Sometimes it happens when a shell hits the ground and limbs are blown off." Anoshina said that on occasion, neighbors bury those killed right in the spot where they died because it's too risky to move their bodies. "One man who couldn't take [the fighting] anymore hanged himself," she said. Gunfire erupted as we talked and stirred up the dirt a few feet from where we were standing. Our group — an interpreter, photographer, driver, rebel minder and I — raced to a short wall a few feet away and crouched behind it, but Anoshina stayed put, holding onto her bicycle and laughing. Danger doesn't faze her anymore. It does faze the few children who remain in Spartak. One of them is 10-year-old Vika, who lives with her grandparents in a windowless basement that became their home after shelling destroyed their second-floor apartment. The basement smells of coal, which the family uses for heating. A cheap carpet hangs on one wall to help keep the damp out. "There is no light, there is no water, so we are just living without it," said Vika's grandmother, Valentina Pleshkova, 54. "We go to the next settlement to charge our phones." They can't afford to move because she and her husband lost their jobs shortly before the war began. Pleshkova said she tries to make life as normal as possible for her granddaughter, whom she walks 20 minutes to a bus that takes her to school. 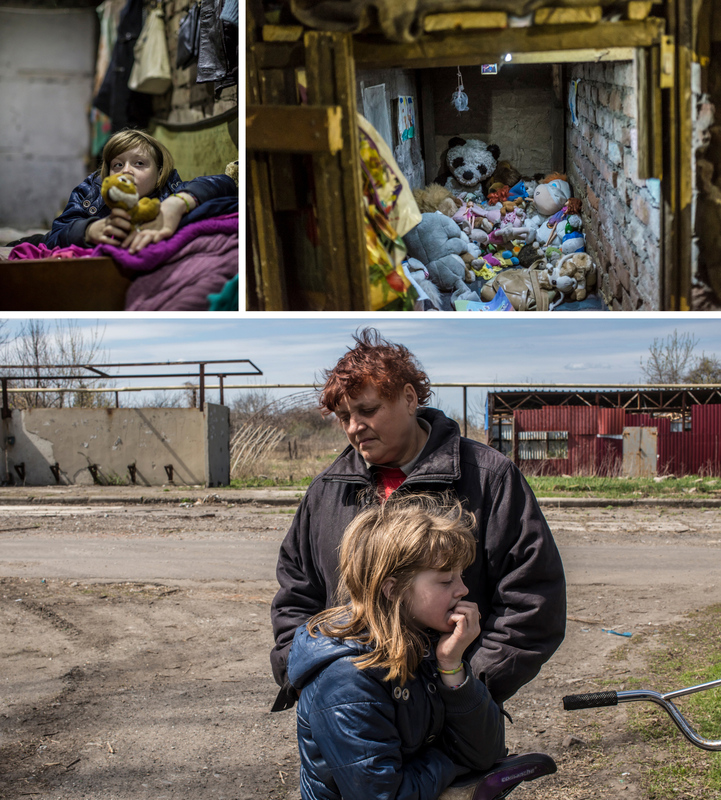 The little girl's mother died of an illness and, her grandmother says, the father moved to Ukrainian-held territory, leaving his daughter behind. "I won't let her go far away and she is always next to me," Pleshkova said. Vika has an assortment of stuffed animals, which she keeps in a hole behind the family's cramped sleeping nook. She perked up when I asked her about her favorite and showed me a stuffed tiger she calls "Star" in Russian. But her grandmother doesn't know how much longer Vika can hang on. "When we lived in the apartment, every year we'd go to the seashore," she said. Vika had her own room. "Now this is what we have, she's constantly asking me: 'Grandma, grandma, when can we go back to our apartment again?'" (Left) Vika, 10, in the underground room where she and her family sleep to stay safe from regular shelling in Spartak, Ukraine. (Right) Vika keeps her stuffed animals in this underground cubby, which also serves as a space to play. (Bottom) Vika and her grandmother, Valentina Pleshkova, 54. Life is also tense on the Ukrainian side of the frontline, especially in the city of Avdiivka. It is home to Europe's largest coke factory, which spews thick, grayish clouds of smoke and is the area's main employer. There, 320 shells have struck the coal-converting plant, although a spokeswoman said most of them were during the first year of the war. Two workers were killed on-site and another eight in the city. 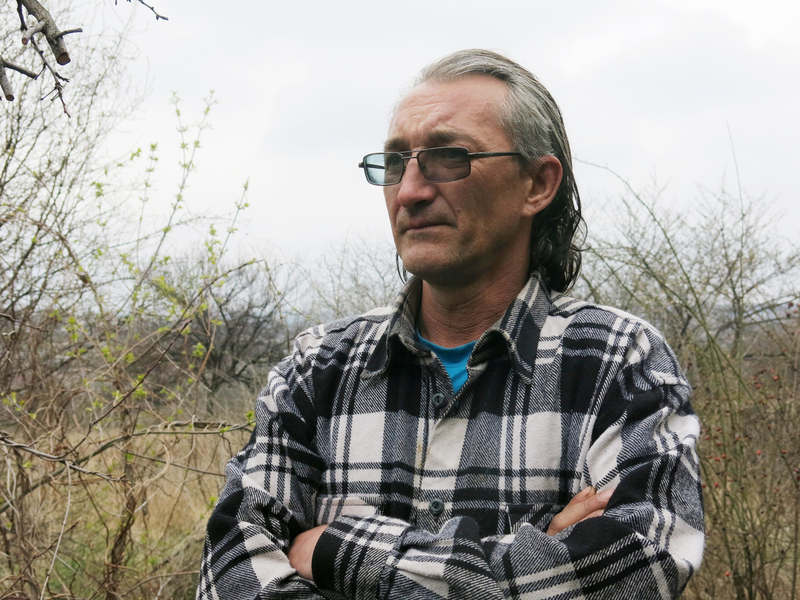 On the other edge of town, handyman Oleg Kovalenko, 44, escaped death last April when a shell exploded over his house as he drank beer and smoked cigarettes with a neighbor. The shrapnel tore a hole in his left shoulder. 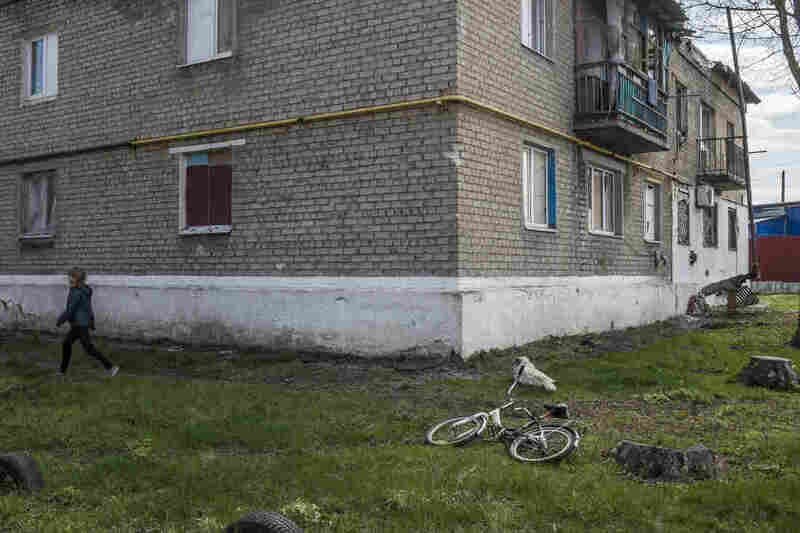 Oleg Kovalenko, 44, was injured on his left shoulder when a shell exploded overhead on the evening of April 5 while he and a neighbor were smoking cigarettes and drinking beers outside his fence. He says he can't afford to leave or repair his property, which is pockmarked from three years of shrapnel and bullets. "Business done over blood," he said, adding if wasn't generating profits for the protagonists, the fighting would have stopped long ago. "Every night there's a lot of shelling," he said. "It's like pingpong — a shell flies in one direction and someone responds from the other direction." 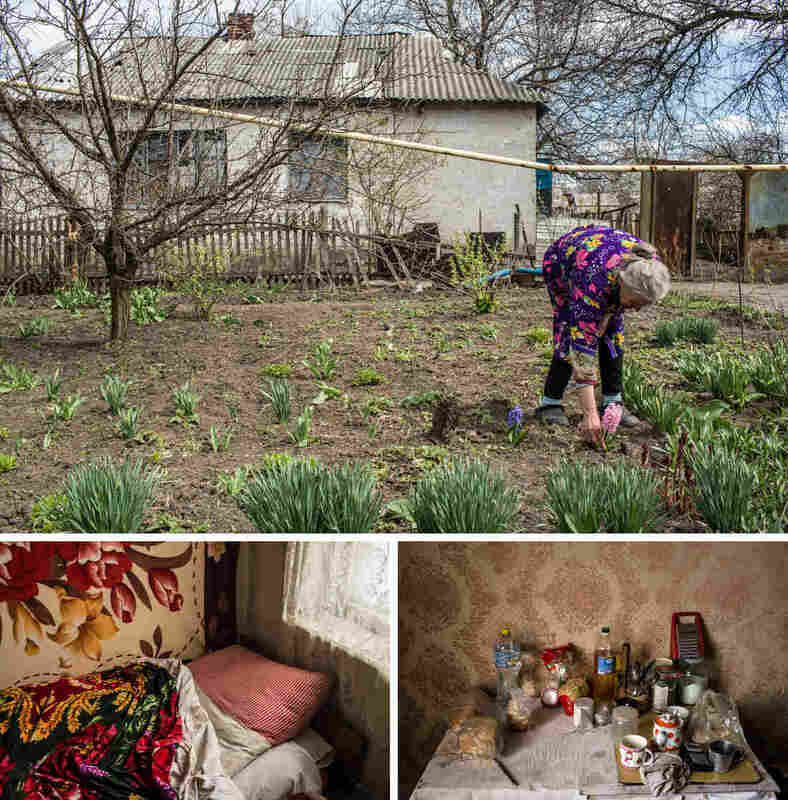 On another side of Donetsk, in the rebel-held neighborhood of Petrovsky, Galina Buriak, 74, said she has stopped wondering when she can move out of the bunker where she lives with 13 others. A metal shed leads to a fallout shelter built in 1974, when Ukraine was still part of the Soviet Union. Buriak said she has slept there every night for three years, despite the chill and damp. She dresses in layers and sleeps curled up beneath a wool blanket on her bed. A little warmth is also cast by portable electric heaters, although Buriak said the bunker's antiquated wiring allows for only one or two to stay on at the same time. "When we lie on the bed, we jump up a bit from the sound of the shells when they land nearby," she said. "The men sometimes go out in the evening, but I don't dare." Instead, she watches an old TV that Buriak said was a present from the separatist mayor of Donetsk. There's no signal here within the thick concrete walls, so residents watch Russian-language DVDs. Two cats take care of the rats and mice. For some of the men, drinking vodka also helps pass the time. 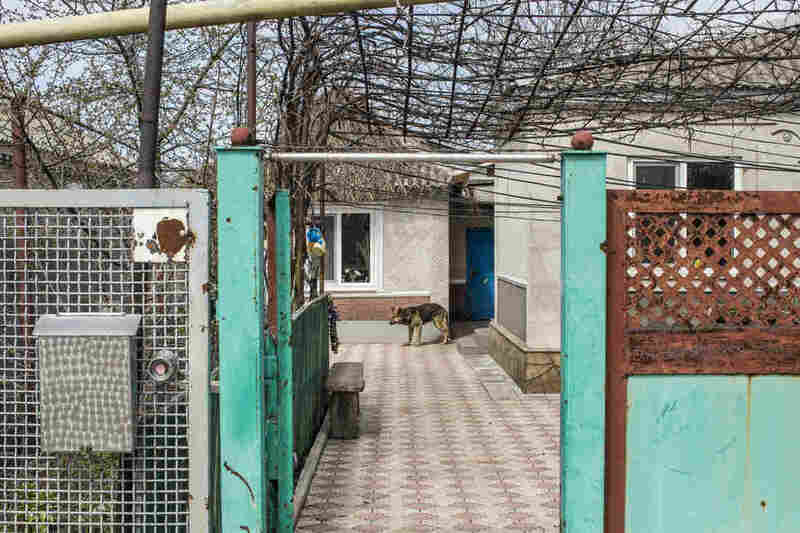 Ruslan Timofeeva, 35, who lives here with his mother, complained that the leader of the Russian-backed separatists has done nothing to rebuild their neighborhood or move the bunker residents to better quarters. Buriak said the only things she likes about the bunker are the Communist-era murals on the walls around her bed. They depict Soviet service members, military aircraft, vehicles and weapon systems. She said she misses the Soviet era: "Life was much better here back then. We had problems, sometimes lacked money, but we had more joy. "What is life like now?" she asked. "If we survive and are able to wake up the next day, we thank God for that."